Besides watching the new season of Banshee (a show clearly less “Nerdsquee” and more “WTFF?” territory), my Friday night TV watching is generally light. And with the recent news of the new season of Hannibal premiering in the summer (! ), its going to be more so during the spring. 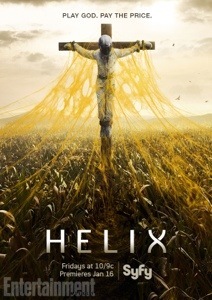 However, as I had some spare time this Friday, I decided to check out the new lineup of shows on Syfy that night. 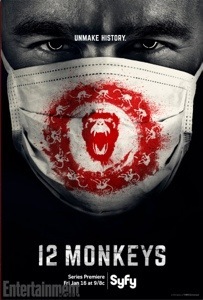 12 Monkeys — Now this show was the one I was the most apprehensive about going into 2015 to watch because, well, I love Terry Gilliam’s 12 Monkeys. Hell, I had a decal of the Army of the 12 Monkeys on my first car. So, how did the first episode of this unlikely movie to TV show translation fare? In short: wait and see. While this show seems to be more leaning towards a 2015 version of Timecop than anything else (and in one of the pilot’s best moments, we get a Timecop-esque moment when two of the same object from two time periods are brought together), I am curious to see how this will play out. There’s some serious deviations from the movie in Brad Pitt’s character from the movie having a gender change (but seemingly still cuckoo), but I like what I see. Whether we’ll get another Terminator: Sarah Connor Chronicles (good) or Timecop (bad) is as I say, a wait and see proposition. So this is one of those shows I went into last year thinking “what is going on?” to this year with the season premiere thinking “no really, WHAT is going on?”. Half the time I would watch season one with the thought of who was on drugs writing this and the other half wondering if drugs might actually help the writing process. There were so many weird tangents and turns in season one that seemed to come out of nowhere and get flushed away just as fast, I was at least hoping this new season would try to start on a clean slate. Well they try to their credit, but instead wander into a whole new realm of batstink lunacy. Instead of creepy Hiroyuki Sanada and an arctic base, this season seems to be creepy Steven Weber and an island. And this comes after a WTF mid-episode reveal that two different kinds of plotlines are going on in the same place for the foreseeable future. And hey, if black goo wasn’t icky enough last season, you got sores growing out of mouths like a fungus this season. My verdict: not in the “must drop everything to watch” section of my viewing habits, but it should make for some incredulous articles from bloggers.